We are conveniently located in downtown Indianapolis, within the heart of the city’s convention, shopping, entertainment and business districts. Connected via skywalk to the Embassy Suites Hotel, Circle Centre, the Conrad Hotel, the Indiana Convention Center and Lucas Oil Stadium, this unique Indianapolis venue specializes in ambiance, excellent service and an atmosphere that will make your party, wedding or special event unforgettable. The stunning architecture of the Indiana Roof Ballroom replicates a quaint, European village with authentic stucco facades and red-tiled roofs, along with a second story balcony that surrounds the room. The soaring 30 foot ceiling behind the balcony is a starry blue night sky with a shimmering crescent moon, creating the illusion of being outside. Styled after the courtyard of a European village, the 15,700 square foot facility includes a 3,000 square foot bar and cocktail area, which showcases an ornate Italian bar, an 8,700 square foot ballroom floor encircled by a 2,500 square foot promenade area and overlooked by a 1,500 square foot balcony area. The Ballroom design consists of ornate arches leading onto the Ballroom floor, which is constructed of one-inch maple strips, spiraling out from the center to the edge, and is cushioned and isolated from the theater below. Above is a domed night sky, complete with twinkling stars and moon. Our banquet hall boasts sophisticated sound and lighting systems, operated by our experienced production staff. 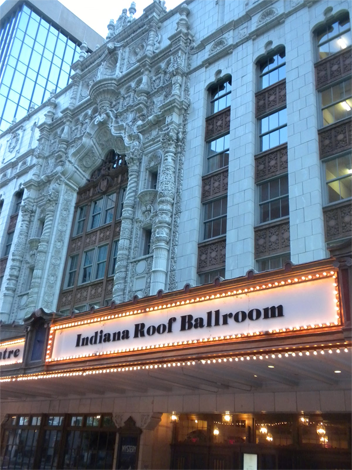 With state of the art, concert-ready audio/visual equipment and live broadcast capabilities, the Indiana Roof Ballroom's professional production crew will work with you to meet all of your production requirements, including sound, lighting, and video. Our award winning culinary staff and superior service staff will assist you throughout your event, providing you with our complete attention. No matter the event - wedding, corporate event, fundraiser or party - we'll do our best to make it truly unforgettable. Website Design & Development by Marketpath, Inc.